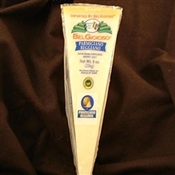 One cannot match the flavor of BelGioioso's Imported Parmigiano Reggiano! The world's most famous hard cheese, BelGioioso Parmigiano Reggiano is perfect for grating but it is truly a delicious table cheese. Use a special almond-shaped knife and make a light side pressure to cut regular flakes. Served on a wooden chopping-board Parmigiano Reggiano makes a beautiful presentation. Mild Provolone Award winning Provolone should say it all, but four 1st Place Best of Class awards at the American Cheese Society in 1999, 1996, 1995 and 1990 sums it all up beautifully!